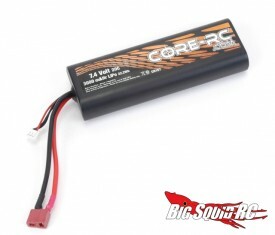 New Lipos from CORE RC « Big Squid RC – RC Car and Truck News, Reviews, Videos, and More! Everybody loves them some lipos… CORE RC has a couple new low cost lipos to feed your lithium polymer fever. They are avaliable in 3000mAH and 4000mAh capacities, 20C discharge rates, and come with a JST-EH balance plug and Deans Ultra plug already installed. These plastic hard case lipos have rounded edges, which mean they should be an ideal replacement for the old 7.2V NiMH batteries that fit in most RTR and sport vehicles. Make sure you check out the CORE RC website for more information!